The following are court results for the Eastbourne area at Hastings Magistrates’ Court from July 14 - 20. Jasper Barker, 44, of Gilbert Road, Eastbourne, pleaded guilty to failing to give information to police relating to the identity of a driver who was alleged to have been guilty of an offence. The offence took place on November 23 last year. He was fined £100 and his driving record endorsed with six penalty points. Andrew Finch, 24, of Vines Cross, Heathfield, was fined £220, with £127 costs for fishing at Pevensey without a licence on November 26 last year. The verdict was proved in his absence. Jack Cheetham, 20, of Percival Road, Eastbourne, pleaded guilty to resisting a police officer. The offence took place at the Hydneye, Eastbourne, on April 11. He was given an 18-month conditional discharge. Marek Ambrozk, 58, of Langney Road, Eastbourne, pleaded guilty to driving a Peugeot vehicle on Willowfield Road, Eastbourne, on June 24, while more than four times over the drink-drive limit. He gave a breath alcohol reading of 145 microgrammes. The legal limit is 35 microgrammes. The court made a community order with a requirement of 100 hours of unpaid work, and banned him from driving for 30 months. Susana Dana, 37, of St Kitts Drive, Eastbourne, pleaded guilty to driving a Renault Clio on Cavendish Place, Eastbourne, on July 2, while over the drink-drive limit. She gave a breath alcohol reading of 57 microgrammes. The legal limit is 35 microgrammes. She was fined £175 and banned from driving for one year. Stuart Watson, 43, of Langney Road, Eastbourne, pleaded guilty to driving a Toyota vehicle on Bourne Street, Eastbourne, on April 6, with cocaine in his bloodstream. He was fined £75 and banned from driving for one year. Liam Montgomery, 18, of Thackeray Close, Eastbourne, pleaded guilty to driving a Vauxhall Corsa on Grand Parade, Eastbourne, on May 31, without due care and attention. He was fined £57 and his driving record endorsed with four penalty points. Ronald Gwynne, 41, of Selmeston Road, Eastbourne, pleaded guilty to failing to provide a specimen of breath for analysis when required to do so by police under the Road Traffic Act 1988. The offence took place at Eastbourne on June 30. The court made a community order with a requirement of 60 hours of unpaid work and banned him from driving for three years. Lloyd Jones, 37, of Down Road, Bexhill, pleaded guilty to stealing Gillete razors worth £216 from Boots at the Arndale Centre, Eastbourne, on July 7. He was given a one- year conditional discharge. Alan Putland, 29, of Hickling Close, Eastbourne, pleaded guilty to three charges of being in breach of a non-molestation order, imposed by the court, by visiting an address and sending text messages. The offences took place at Eastbourne between July 2 and 7. The court made a community order with a requirement of 100 hours of unpaid work. 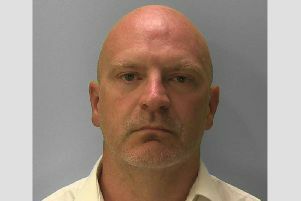 Steven Divito, 46, of Albert Parade, Eastbourne, pleaded guilty to two charges of assault by beating. The offences took place at Eastbourne on April 13. The court made a community order with a requirement of 60 hours of unpaid work and ordered him to pay £50 compensation for each offence and £200 in prosecution costs.